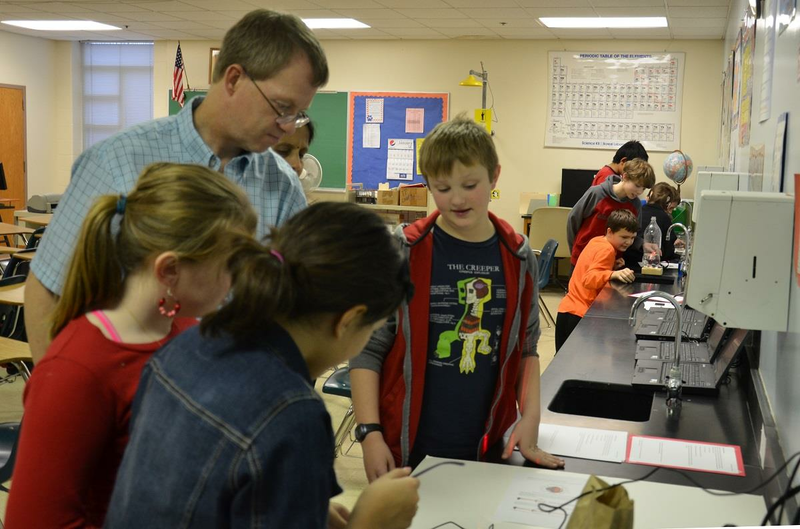 Through its outreach programs, Physics Illinois provides local school children with engaging hands-on science experiments.These photos are from one of Morten Lundsgaard's regular visits to the Science Club at Mahomet-Seymour Jr. High School. 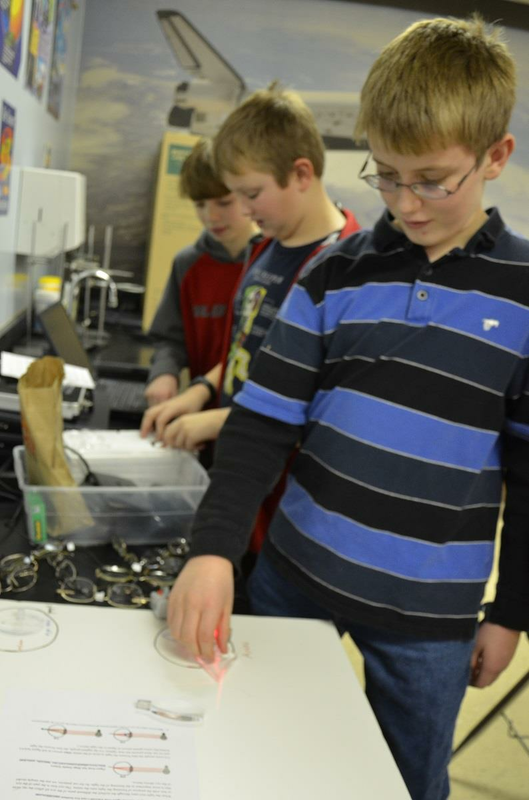 On January 16, 2014, he led the children in a broad exploration of the properties and behaviors of light. When does the Sun really set? At this station, students were asked to answer this question, using a hands-on model. 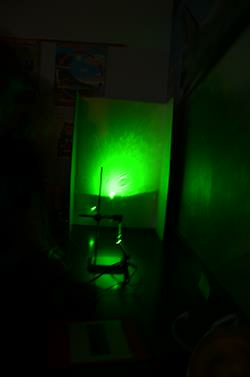 A laser pen represented the Sun, and a tank of sugar solution, with increasing sugar density towards the bottom of the tank, represented the Earth's atmosphere. With this set-up, the Science Club members were able to figure out that we can see the Sun after it has set below the horizon because the atmosphere bends its light toward us. 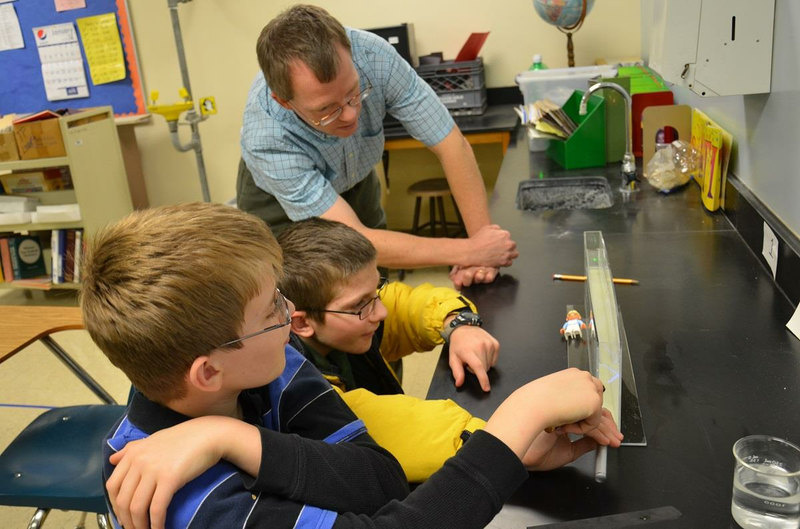 Students at this station learned that a stream of water can bend a beam of light. 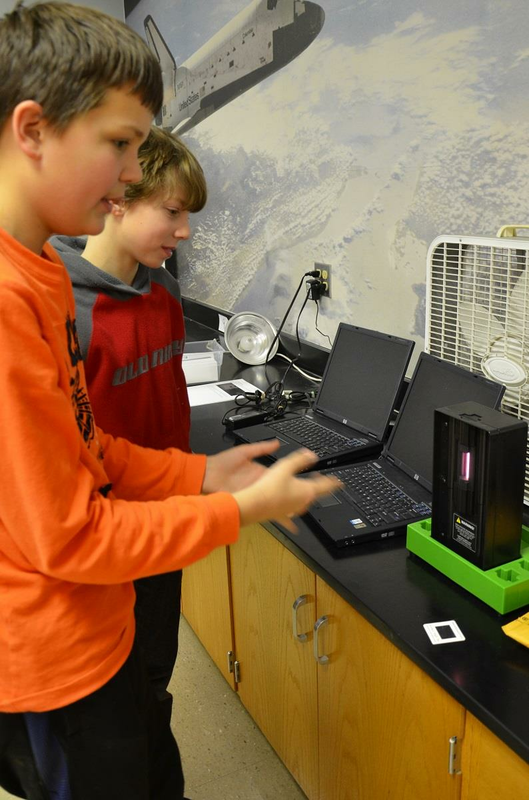 At this station, the students experienced how diffraction grids can be used to analyze the light emitted by atoms and molecules and discussed how this type of analysis of starlight tells us what stars are made of. The students also tried to look at the 'stars' of the classroom, the fluorescent lights on the ceiling, to see if they could figure out what is inside of fluorescent light bulbs. 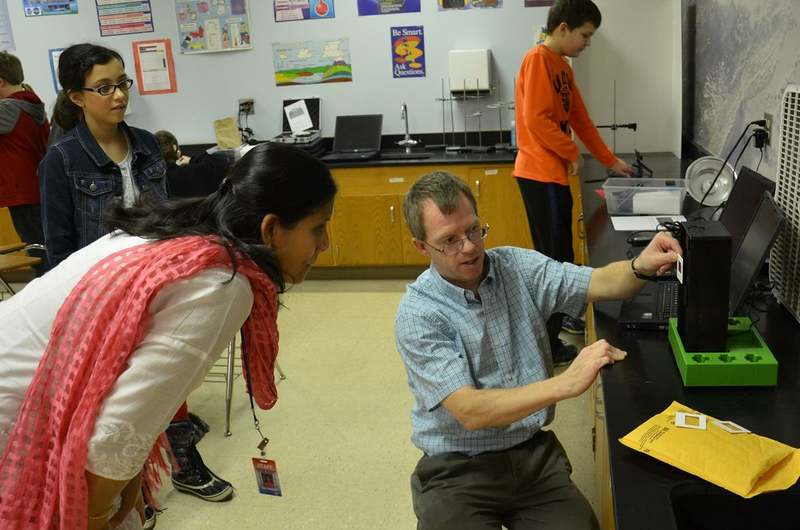 Mahomet-Seymour teacher and Science Club coordinator Geetha Sivaguru examines the diffraction grids station. At this station, the 6th through 8th graders studied human vision and learned how eyeglasses differ for near- and far-sighted people. 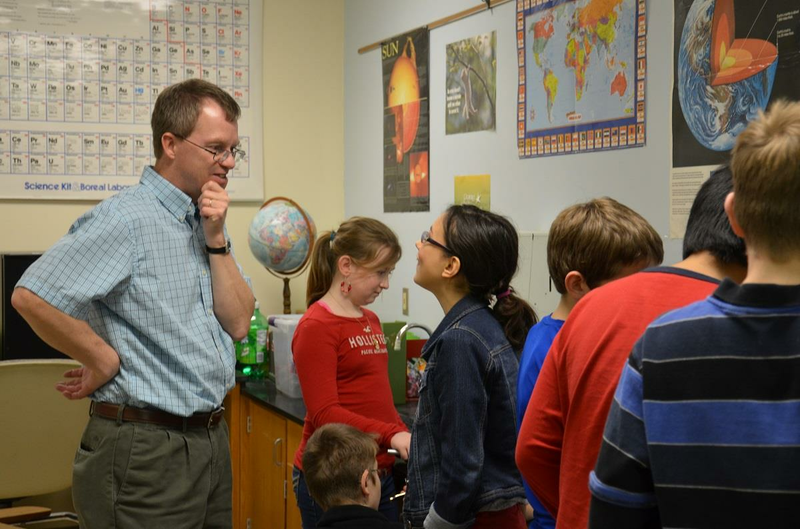 Learning how eyeglasses correct vision is especially intriguing for scientists who wear them ! The students also investigated the science classroom's tap water, using a green laser pen and a drop of water as their microscope. By suspending a water droplet with an eyedropper and aiming a laser light through it, they projected the image of the water drop onto a white poster board. 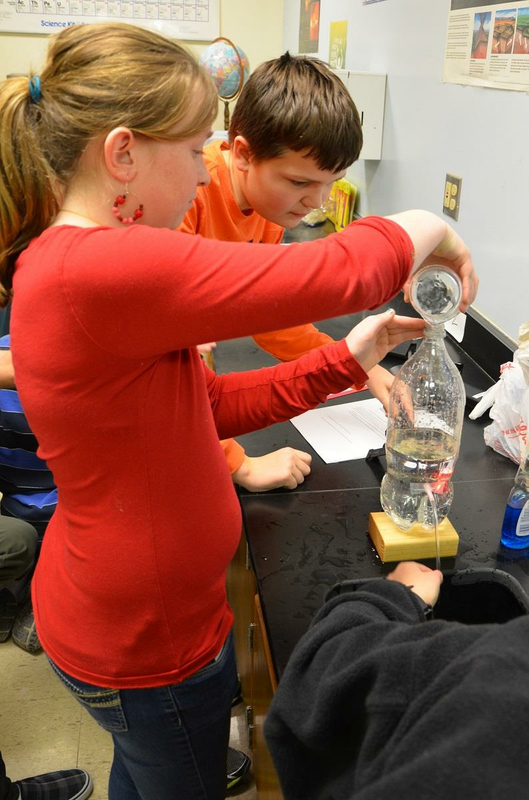 The students discovered that there is more than water coming out of the tap in the classroom! The water drop acts a spherical lense and gives a magnification of about 1000, which is sufficient to see microspic particles floating around. If you are curious and wish to know what is inside a drop of pond water, you can check out this video from Ann Arbor Scientific http://www.arborsci.com/deluxe-green-laser-pointer. The promising young scientists got the chance to pose some insightful questions.